⬅ How Can a Brow Lift Benefit You? Eyelid surgery is an operation that can dramatically improve a patient’s appearance within a relatively short recovery time. Droopy eyelids is one of the major reasons why some people often consider eyelid surgery (blepharoplasty) to get rid of excess eyelid skin for a youthful appearance. 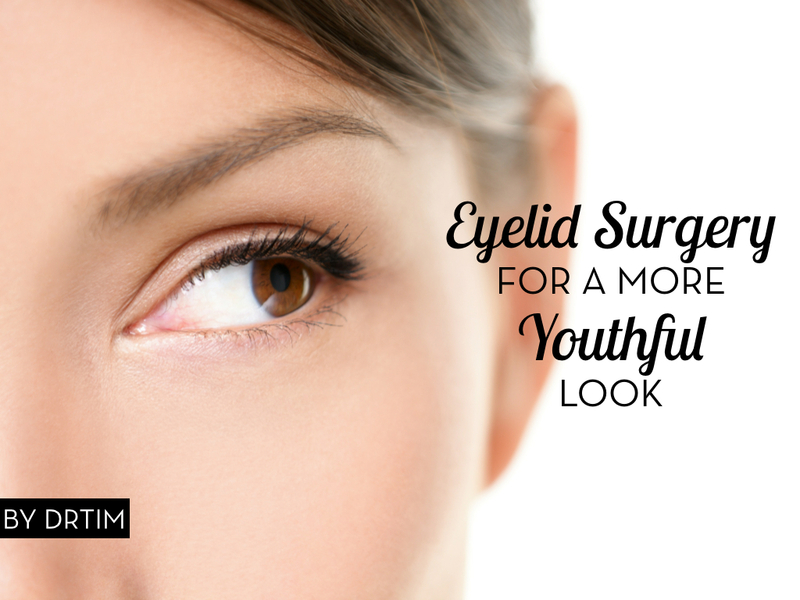 In other cases, eyelid surgery helps in improving ones vision by offering a field of view that is less obstructed after the removal of excess skin. your plastic surgeon will make accurate markings to show where the excess tissues will be removed on your lower and upper eyelids. On your upper eyelid, they will make a surgical slit concealed in the natural fold of the upper eyelid. In the lower eyelid, the surgical slit will be concealed below your lower eyelashes. When unwanted fat only is being removed, the slit can be made inside the lower eyelid which is referred to as a transconjunctival incision. Laser resurfacing may at times be used together with this method so as to make the lower eyelid skin tighter. The plastic surgeon will also get rid of excess tissue through these slits. At times, fat may need to be redistributed in the lower lids to completely remove bulges or puffiness. Other changes may be made so as to correct special problems such as muscle laxity. The scars are generally inconspicuous after healing. For patients who have dry eyes, very little amounts of tissue are removed to avoid exposing more of the eye to the air which may worsen the symptoms. If you have too much skin hanging or covering the upper eyelids natural folds. If loose skin hangs down from the upper eyelids over the eyelashes. If the under of your eyes has deep grooves and bulges. If both your upper and lower eyelids look puffy, making your eyes appear aged and tired. Many people who consider blepharoplasty also consider facelift, wrinkle smoothers, brow lift and dermal fillers for a complete facial rejuvenation look. What will my eyelid scars look like? Upper eyelid surgery: The plastic surgeon will mark the natural lines and creases of the lids and keep the incisions as concealed as possible along the natural folds. Thin sutures will be used in closing up the incisions hence making the scars visibility minimal. Lower eyelid surgery: In the traditional blepharoplasty, the doctor will make the slit in a hidden side along the lash line and smile creases of the lower lid. In the transconjunctival approach, the doctor amends the eyelid puffiness that results due to excess fat by making a cut inside the lower eyelid. This technique doesn’t need an external slit but it cannot be used in the removal of extra skin. This is one of the fast healing surgeries that I undertake. However, it is important that you adhere to all the postoperative procedures that are given. This will include instructions about iced eye pads, bandages and taking of antibiotics if prescribed. I will also offer detailed instructions about the normal symptoms and any signs of complications. The amount of recovery also varies among people so it’s good to be patient and not rush things. Fortunately, eyelid surgery has very minimal complications. Thousands of people undergo successful blepharoplasty and are happy with their transformation. However, all surgical procedures come with some degree of risk. Some of the complications may be watery eyes, infection and bleeding, allergic reactions, sensation changes, asymmetrical scarring and haematoma. Question: What is the most troublesome thing you find with droopy eyelids? You can leave a comment below. I am 49 and have lower bags which are hereditary. There’s no fat in the bags and pulling the skin up beside my eyes eliminates them! Desperately seeking lower blepharoplasty before I’m 50!